Looks like some interesting changes could be coming to Overwatch character Sombra. Posting on the official Overwatch forums yesterday, Principal Designer Geoff Goodman detailed some Sombra changes Blizzard is currently testing, including infinite invisibility. "These changes started by seeing how far we could push the duration of her Stealth and Translocator abilities," wrote Goodman. "As we pushed them out, it allowed her to play more and more as [a] scout/infiltrator for your team and also allowed her more time to pick and choose when and where she popped out to ambush her enemies”.”So now she has infinite duration on both Stealth and Translocator." Sombra's Stealth ability allows her to become invisible, but it currently lasts for only five seconds of invisibility at a time followed by a cooldown of six seconds. The Translocator, a projectile Sombra can toss and teleport back to later, has an active timer of its own, lasting 20 seconds before being put into a four-second cooldown before another one can be tossed. You can read the full post here. 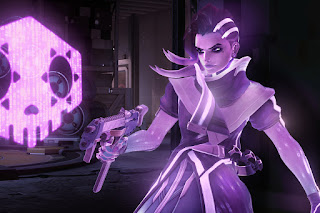 It’d be an interesting change for Sombra, but at the same time could make her a bit OP. Thoughts ?